Conifers vary greatly in size. The very tallest conifers are the Giant Sequoias, which can grow up to 312 feet. The stem provides a way of transportation for the nutrients between the leaves and roots. It also lifts the leaves towards the sun to allow for photosynthesis. The stems of conifers have growth rings that usually indicate how old the plant is, because there is a light ring that shows the growth time in the plant and a darker ring that indicates a dormant time. The stem is protected by an outer covering called bark. The roots of conifers are for gathering water and nutrients from the soil and sending it up though the stem. The roots also serve as anchors to keep the tree planted in the ground. Conifer's roots are usually quite shallow, which means that they can sometimes be uprooted by wind storms. Conifers have a largely varied life span. Some species lives for decades, while others live for thousands of years. The oldest conifer trees are the Brislecone Pines. Some of these trees are up to 5,000 years old. Conifers are found all over the world. Since conifers are trees, they create forests. 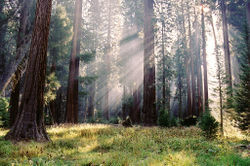 Coniferous forests are found on every continent except for Antarctica. These forests create habitats for many different kinds of plants and animals. Some animals live in conifers, some plants and fungi grow on top of conifers, and conifers provide rain cover and shade for other living things as well. 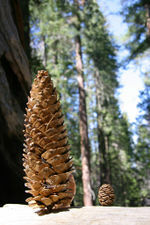 Conifers are primary producers in many ecosystems. Conifers are also useful to the environment as carbon sinks. They pull carbon out of the air for photosynthesis and can store large amounts of carbon in their trunks. ↑ 2.0 2.1 2.2 Earle, Christopher. Conifers Biology Encyclopedia. Web. last accessed May 18, 2017.